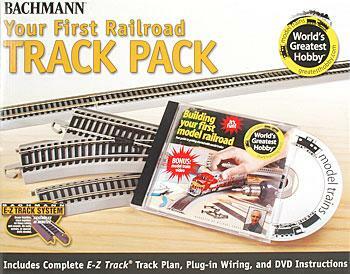 This 43-piece track pack has all the E-Z Track snap-fit track (with molded roadbed) you'll need to build the layout featured on the enclosed DVD: "Building Your First Model Railroad" hosted by Michael Gross. Track pieces have nickel silver rails and black molded ties with realistic wood grain detail. Easy track assembly...no nails, screws, or special tools needed.